31 -- Rattlesnakes are poisonous but seriously, where's the literal poisoning? This is Deathdark's latest agenda -- they seek to find children and find out if they are all fit for their future Deathtopia or not. Unfortunately, Rattlesnake Mozoo is THAT STUPID not to get qualified children for the poison the minds of the youth program. It's up to Saboru as he discovers this plan to create a Darwinian empire. It was also fun to see how Saboru teaches the meaning of strength to a group of children. He shows that you don't always start out strong -- a contrast to Deathdark's sinister scheme where children not qualified to join their program are literally vaporized. 32 -- My extreme favoritism for Kenichi shows up again in this episode. Deathdark has yet another convoluted scheme where they steal the bones of humans via Hermit Crab Mozoo. I was expecting them to turn into rubber or blobs but WTF -- they are just WIGGLING on the floor. Kenichi meets his old friend -- a policeman who helped him rescue his pet puppy when he was younger. The same policeman became a security guard at a fish sanctuary. What do I love this episode? I love how Kenichi uncovers the real reason why his friend quit the taskforce. Whatever the job was -- his friend was doing it and that's what Kenichi tells his friends' brother. It was also interesting to have a Hermit Crab monster whose shell almost made him indestructible. It was fun seeing trying to get rid of that shell. Facedesk to Deathdark though -- WTF why didn't they give the Kong a shell too? 33 -- Someone's got a Cinderella story to tell. Deathdark seeks two Indian bracelets which they failed to grab from some magical kingdom. An Indian man named Ramdus (almost a play on Ramdas from A Little Princess) appears and discovers the last heir of their kingdom. It turns out that an Indian princess became a civilian and married a Japanese scholar -- giving birth to a half-Japanese, half-Indian girl who's the heir designate of the kingdom. What better focus for "A Little Princess" here than Miki? The secret of the two bracelets is that they only work on living beings. Since when were Mozoos considered living beings? From what it looks like -- most Mozoos are actually bio-cyborgs or most of them are mechanical. Sure, they do have biological components but apparently it's like how Cell was created in Dragon Ball Z. Miki exploits the knowledge and the Goggle V defeat Tiger Mozoo who was tasked to destroying Goggle Caesar. 34 -- A sudden midseason upgrade? 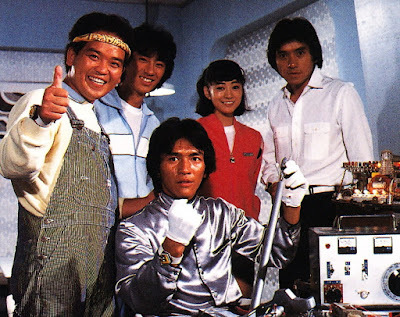 Well Hirohisa Soda himself in his earlier days tend to introduce new upgrades in the 30s during the 80s -- such as Dynaman's New Dynamite Attack, Bioman's Super Electron and Maskman's Jetman. Deathdark features a new monster called Crocodile Mozoo which was born from Neo Metal. It's the fault of some scientist who was hostage. Worse, I find the whole fact that Deathmark wants to marry a woman centuries younger than he is for his wife to be just weird. The Goggle V work on a new technique to replace the Goggle Victory Flash. They decide to upgrade their swords to reveal the Goggle Golden Spear technique. It's a more powerful attack but it does take slower to release so why didn't Deathdark develop a counter to it? Or are the Goggle V members moving faster than we think? Super Sentai logic is just fun to speculate on hehe! 35 -- Children don't waste for your food is the moral lesson of this episode. One of the Computer Boys namely Haruo is seen wasting food. This irritates the child of the week who runs an African exhibit. The reason is because the siblings who run the library both see how Africa is a beautiful country with mass starvation. Haruo sees the error of his ways in this episode. Deathdark's latest scheme is really dumb -- turn humans into monsters that crave for metal. 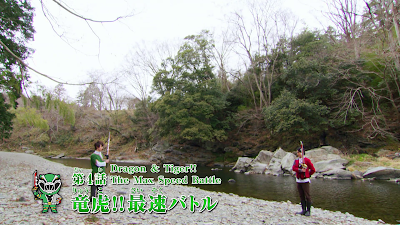 If I'm to talk, Baranoia would have borrowed this concept and put it into Ohranger. I really find this episode to be funny than nightmarish. We've got fake make-up and WTF what does Deathdark hope to accomplish with metal-eating humans? 36 -- A porcupine with a gun? This made me wish that guns were implemented already in Goggle V but again even other newer Super Sentai don't necessarily have guns, right? Porcupine Mozoo is Deathdark's latest creation -- a dangerous gunman expert and his target is Goggle Red! This results to a dangerous dilemma as Kenichi is gunned down and it hurts. 37 -- An aerial bomber in the form of Flying Squirrel Mozoo? Deathdark kidnaps a well-known weatherman so they could do this plot effectively. I find the whole idea of a silent bomber scary as you'll never know where it will hit next. Worse, the meteorologist is forced to make the right computations OR the Deathdark will kill his grandson. How low can Deathdark get? What makes this episode scarier is showing once more how cheaply Deathdark thinks of life. The metereologist's grandson and his two friends have bombs strapped on them. Ouch! It almost reminds me of terrorists who use young children to carry out whatever deadly operation they have. Fortunately, Goggle V is able to save the children and defeat Flying Squirrel Mozoo. 38 -- An episode focused on both Saboru and Futoshi. Saboru is showing his desire to create a jetpack which could change Goggle V forever -- or not. The jetpack's appearance where it doesn't look like Bandai merchandise material tells you it wasn't meant to be. There's a lot of mishaps here especially where Deathgiller and Mazurka get a ruined jetpack and learn how to upgrade Rhino Mozoo's attack. I like how Futoshi tries to encourage Saboru not to give up. They learn that a rhino's horn needs to be cut off but it requires real effort. Futoshi tries to endure a wrecking ball OUT OF SUIT which for me is pretty much WTF -- he could have killed himself. 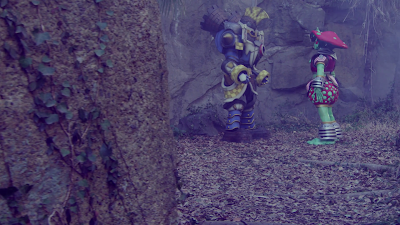 Saboru creates another jetpack which is unfortunately good for one use to help defeat Rhino Mozoo. 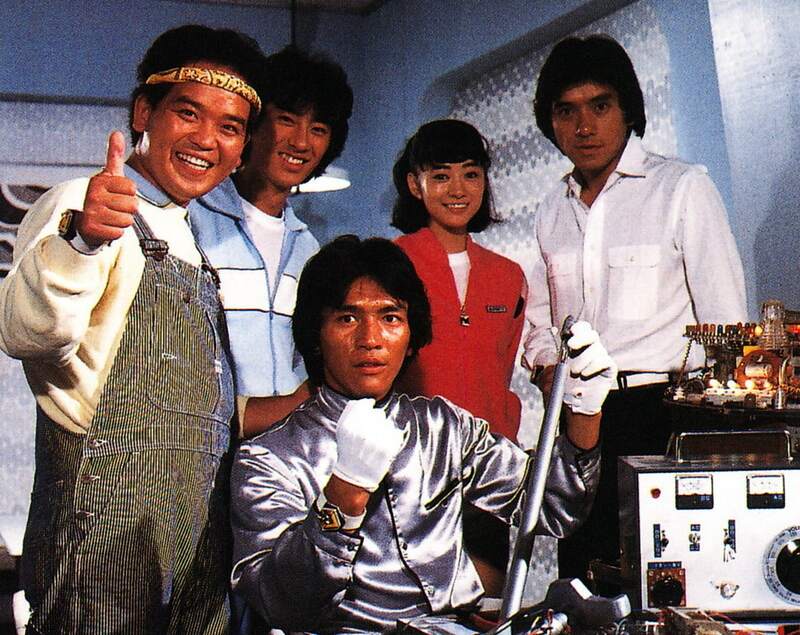 The episode ends with a hilarious bang which is almost a preview of Dynaman! 39 -- Before Turboranger had its episode where a painting devours people -- we have this episode where a picture book devours people. Mazurka disguises herself as a civilian yet again and distributes some books. None of the people are yet too aware of Mazurka's disguises except for a few. This new crazy scientific breakthrough has some magic in it. The books devour the readers when they reach the page with an owl drawing. Owl Mozoo traps them inside it. Unfortunately, one of those who gets trapped is Miki! Yes, Miki gets trapped inside the book and that's good news for Deathdark. They decide to sacrifice her to the dark gods of Deathdark by BURNING that same book. What amazes me is how Miki manages to survive the whole ordeal with her wits. Who says that you have to be that strong? Miki proves that she may not exactly be physically that strong (the strongest is Futoshi) but you need her wits in order to run a team properly. 40 -- Tatsuya gets captured by Deathdark thanks to Walrus Mozoo. When the Deathdark starts extracting memories -- they discover something about the Computer Boys and Girls. The Goggle V must exercise caution as Mazurka and a few goons try to find out where the base is. It's a pretty well blended plan. Goggle V must make sure that their secret base isn't discovered. It was somewhat crazy to think how the frozen humans are still alive. Both Goggle Blue and Goggle Yellow are frozen and they must be thawed. Tatsuya is also frozen. The wits of the Goggle V manage to outdo Mazurka's devious plan -- which may soon explain why she's soon to become a disposable which I'll write to somewhat conclude this Goggle V rambling! Meanwhile, I'm still going to have to watch Goggle V episodes 41 to 50. 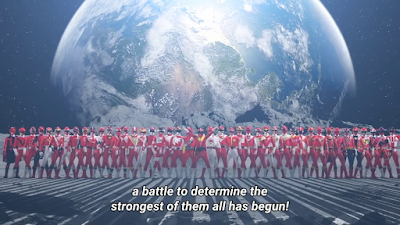 I may not write the conclusion immediately since I'll do the weekly Patranger vs. Lupinranger review first. I may wrap things up some time later but until then -- I hope you've had fun reading!